Urban planning excellence or disaster? The district of Poblenou, on the coast to the north east of Barcelona is currently the city�s largest building site on land earmarked for redevelopment since before the Olympics. 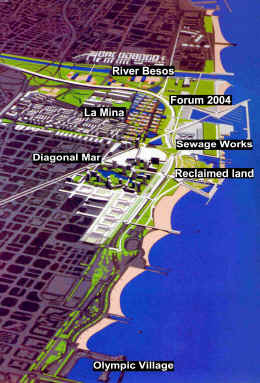 The redevelopments involve two key schemes, both interlinked: Diagonal Mar and Universal Forum of Cultures. The shortage of available land within the city suggest these may be the last grand urban projects for perhaps the next fifty years, and the long time taken to come to fruition should have enabled careful assessment of future viability. However, both involve new concepts that have yet to be fully tested. They have come at a point where Barcelona may be beginning to show lag-time between its dazzling, international image and socio-economic change. Furthermore, development-saturation is creating problems of increasingly difficult accessibility within the city. Diagonal Mar is a unique concept in Barcelona, combining hotel, retail, housing and offices into one planned community covering the equivalent of 15 city blocks. The Universal Forum was the site of the first Universal Forum of Cultures held in 2004, involving debates, themed exhibitions and the World Festival of the Arts. This follows Barcelona�s tradition of using international events to revitalise decaying parts of the city infrastructure. This was the fourth (and smallest) of the city�s great infrastructure projects, following the two International Exhibitions (1888 and 1929) and the 1992 Olympic games. Diagonal Mar�s services of hotels, offices and a convention centre were used as the Forum�s headquarters. The location, the Poblenou former industrial district, bordering on the Bes�s river, was proposed as long ago as 1987 as one of the 'new centres' of the Barcelona of the future. The land became available as a result of the closure of many old textile factories and gas works and the massive changes the city underwent as it prepared to host the Games. The coastal strip was zoned for new tourist and residential functions, including the creation of the Olympic Village and a series of artificial beaches. 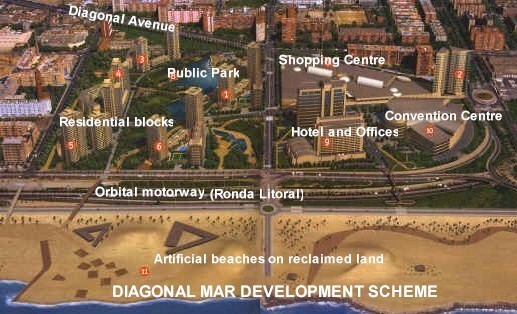 Diagonal Mar is located where the city�s main artery, the Avinguda Diagonal, meets the sea. The Universal Forum of Cultures was developed closest to the Bes�s on land partly belonging to the town of Sant Adri�. The site is adjacent to a residential district with the greatest social deprivation in the Barcelona metropolitan area: La Mina. Additional investment of 141 million euros to improve the quality of life in La Mina is being provided by the city authorities with assistance from the EU City Neighbourhoods in Crisis fund. The aim is to help reduce the potential conflict that will be generated by wealth and poverty in very close proximity. Some of this conflict has already found its way to the doors of the Diagonal Mar shopping centre, the largest in Spain. 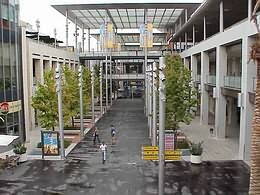 The centre involves the bringing of American retailing concepts to the city, combining shopping with leisure and entertainment and its success may be critical to the overall development. The centre is anchored by the French Alcampo hypermarket and the American AMC cinema chain. The centre�s 240 stores are planned around these anchors. The first floor features �necessities of life�, the second is devoted to fashion and the third floor, entertainment and restaurants on a terrace overlooking the sea. Across the road from the shopping centre is a park covering some 15 hectares, ceded for public use during the day. The late architect Enric Miralles has laid it out in the shape of a giant tree. 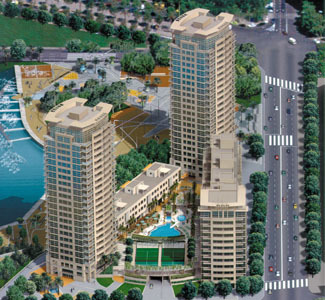 The trunk forms a central promenade, starting at the entrance of the shopping centre on the Diagonal road, and zigzags alongside a large lake down to the sea. Land reclaimed from the sea using earth extracted from the development will be used to house a planned zoo and marine park. European Monetary Union, climate, hotel infrastructure, the new beaches and the supply of leisure facilities will help the Diagonal Mar and Forum schemes. But question marks remain regarding future viability and problems lie on the horizon. Other problems include the city�s sewage works, on the doorsteps of Diagonal Mar. This was given a roof in time for the opening of the Forum, but is still not a particularly enticing prospect for those looking to enjoy the fresh air or new beaches. Issues with flooding of the underground car park have been solved, one hopes. The most difficult problem to solve, however, is the lack of local shoppers with money to spend. The real spending power in the city lies in the Zona Alta district, several kilometres the other end of the Avinguda Diagonal and although this avenue has been recently linked to Diagonal Mar, numerous road junctions and severe traffic congestion make it an impractical main access route. Problems of accessibility to high spenders are likely to remain for many years to come and there have been a number of press reports suggesting Diagonal Mar chain stores will close once their contracts expire. 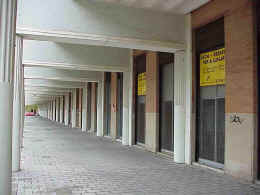 Other press articles have focused on the nearby shopping centre of La Maquinista which met serious financial problems due to similar poor accessibility and consequent lack of more affluent customers after only nine months of opening. Luxury stores in the La Maquinista centre complain of very low sales insufficient to cover rents of �40/ m�/month, and high losses through theft. The Carrefour hypermarket, the anchor store for the centre rarely uses more than 10 of its 38 tills and has only 3 open during the middle of the day. 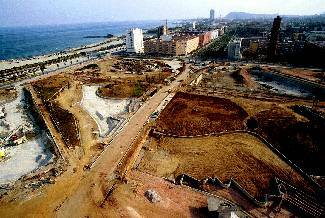 Diagonal Mar's Alcampo appears equally empty. Did the developers and retailers really do their homework? And La Maquinista is not the only large urban commercial centre competing with Diagonal Mar for customers from the Poble Nou catchment area. The Gl�ries centre is a very short journey away, and another leisure complex, Heron City has opened nearby. This leaves the wealthy Zona Alta served by just one shopping mall: l'Illa. The 10,000 new apartments being constructed in the vicinity of Diagonal Mar should bring in people with spending power, but the experience of the nearby Olympic Village, where apartments have been priced out of the range of many young urban professionals, suggests that the money may be in short supply or may not necessarily be spent locally. There are recent signs of economic rejuvenation in the Olympic Village area, but many ground floor commercial premises still remain vacant. Distance from the central business districts of Pla�a Catalunya and Zona Alta may be largely to blame for the lack of life in the Olympic Village, but for the Barcelona Mayor, Joan Clos, the Village with densities of 60 dwellings per hectare, is an example of what should not be done in city planning. Besides inappropriate planning densities, the impact of the La Maquinista, Olympic Village and Diagonal Mar projects suggest that the success of urban redevelopments depends on the ability and willingness of the city�s permanent population to become active players within the changes. In only a little over twenty years, since the death of Franco, Barcelona has modelled itself as a service city, a product for international consumption geared to upper echelon foreign visitors. Socio-economic changes within the city have lagged behind this image, a problem that will be very difficult to correct in the short term. Furthermore, counter-urbanisation trends have seen an increasing number of the young and middle and higher income groups leave the city seeking a better quality of life in the surrounding satellite towns and villages. Diagonal Mar is not designed for the ageing population left behind. The long-term success of the redevelopments relies on reversing counter-urbanisation trends and socio-economic changes in the Poblenou area. It requires a shift of the city�s central business district, which itself is dependent upon families from the wider region prepared to brave long journeys and traffic delays for a day�s shopping and leisure 'experience'. Diagonal Mar may well be trying to create a shopping and social revolution rather than riding on the back of an existing one: a risky business, and time will tell.